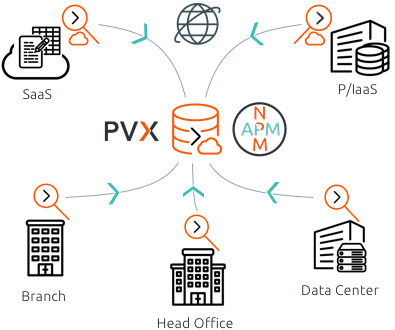 SkyLIGHT™ PVX provides network and application monitoring (NAPM), network performance management (NPM) and application performance management (APM) in real time. Highly scalable and fully integrated, SkyLIGHT PVX provides 360° network visibility and analytics for all types of IT infrastructure—physical, virtualized, software-defined, and cloud—for organizations with thousands or tens of thousands of users. Taking advantage of latest-generation stream analytics, SkyLIGHT PVX keeps track of every network flow and application transaction at scale. SkyLIGHT PVX offers a new approach to network performance monitoring and diagnostics and real-time application monitoring, including end to end transaction support, with exceptional ease of use and universal coverage over physical, virtual, and SDN infrastructure, complemented by full network visibility, transaction-level application visibility, network application performance analysis, and visibility into the real-user experience. With proactive network monitoring and real-time application monitoring, SkyLIGHT PVX drastically reduces mean time to resolution (MTTR) for critical business incidents via a single interface for network and application performance analysis. Thanks to key network performance and application performance indicators monitored across all network traffic and application transactions—and presented in a network performance dashboard and application performance monitoring dashboard—IT professionals can take appropriate action to proactively keep network and application services up and running for end-users or customers. A fully integrated network performance monitoring and diagnostics solution, SkyLIGHT PVX provides a granular view of individual network and application transactions, whether a TCP retransmission or a TCP zero window, as well as many other indicators of network slowness. SkyLIGHT PVX is the complete solution for network and application monitoring and performance management. SkyLIGHT PVX’s advanced IT performance monitoring capabilities are available in a range of hardware or software appliances that fit any type of IT architecture: classic, virtual, software-defined, or cloud-based data centers. Lightweight, self-contained, and high-performing, the SkyLIGHT PVX network packet capture appliance is ideal for monitoring remote locations with limited on-site infrastructure. With a packet analyzer operating at wire speed, it’s ideal for quick application and network performance audits or troubleshooting sessions. Site appliances are ideal for monitoring the performance of remote branches or small data centers. Traffic access options include the SkyLIGHT PVX network packet capture appliance running on physical or virtualized infrastructure locally or the SkyLIGHT FBX virtualized packet broker that can remotely relay traffic from any point of interest to a centralized PVX datastore. 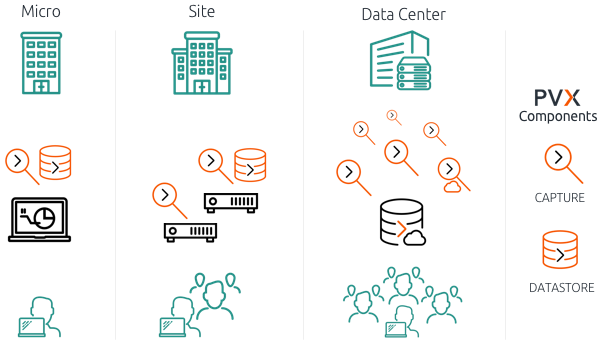 Designed for large data centers, corporate offices or cloud deployments, the SkyLIGHT PVX network monitoring appliance can be deployed at scale with a mix of physical, virtual, and cloud capture appliances delivering wire data analytics to a centralized datastore, ensuring full coverage over hybrid infrastructures including software-defined networks, IaaS, and SaaS applications. The SkyLIGHT PVX datacenter appliance is ideal as a web application monitoring solution. A single SkyLIGHT PVX datastore appliance, which may also perform traffic capture, centrally stores results and provides a single interface for data visualization, reporting, alerting, stream analytics, and capture appliance management. It also acts as an interface to other systems via its open API.